The minute you turn into Rockbarton Park, located off Salthill Promenade, you immediately see why so many people would love to call this home. No 33 Rockbarton Park is in the heart of Salthill, just a stroll from the Promenade, in a beautiful mature residential setting. These exclusive residential developments were built when green areas and spacious living accommodation were not extras. This extended home is a rare find as it has very recently been extensively renovated, extended, and very tastefully decorated throughout. The entrance hall is wide and bright with beautiful solid oak floor that runs throughout the house. Off the entrance hall there is a sitting room with feature solid fuel Heritage stove, and a dining room with south facing patio door opening to large sun filled decking. The new cream fitted kitchen has a very generous range of built-in and overhead units with integrated cooker, gas hob, extractor, and microwave. There is a lovely cosy family room off the dining area. A new downstairs toilet, shower, and large utility were also included during recent renovations. The bright and spacious first floor has three newly decorated bedrooms and a new bathroom. The attic has been converted and currently hosts a large double bedroom. The back garden is south facing and the front lawn has been fully removed and beautifully paved for ease of maintenance with ample off street parking. This home must be viewed to fully appreciate the quality on offer. The most important thing about any house is the location, and the independence that location can give a family as it grows. 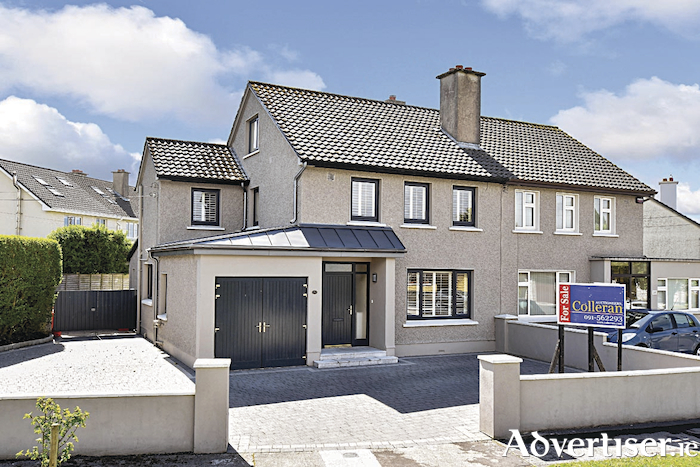 With Rockbarton everything is within walking distance, from excellent primary and secondary schools for both boys and girls to every sports facility including Gaelic football, hurling, soccer, camogie, tennis club, golf club, and Leisureland swimming complex, along with parks, beaches, promenade, church, and shops all within easy reach. Because of its location and stunning condition this home will equally appeal to young families or anyone looking to retire to a quality home in a mature setting. This property is for sale by private treaty at a guide price of €560,000.